Thinking of Coconut Palms, the imagination will take most of us to a pristine island into the tropics and put a smile on our face… gourmet and conscious health foodist have all reason to smile even more: after Raw Virgin Coconut Oil has been introduced to the food market and the array of health benefits of the delicious Coconut oil has been scientifically revealed, Coconut Sugar and Coconut Water came into the spotlight. 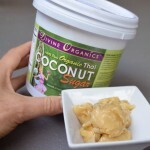 Though Coconut Sugar and Palm Sugars have been traditionally used in Asia, Divine Organics introduces a rich and creamy version of pure Coconut Blossom Sugar. Actually, it is so tasty that many of our customers snack on a spoon-full here and there. 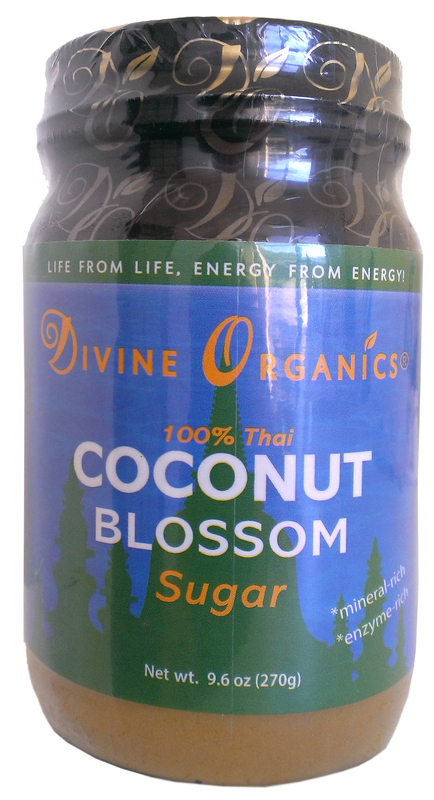 New in our Coconut product line — Coconut Blossom Nectar, the liquid delicious sweetener in the glass bottle. Our Coconut Sugar is unique on the market, it is creamy and delicious and can be spooned directly from the glass. It is derived from the fresh sweet nutritious sap of the coconut blossoms; thickened under controlled heat to avoid overcooking which would affect the nutrients and acidity. In addition to the listed Nutrition Facts our sugar contains only 12% sugar, and has a higher nutritional content than other sweeteners; it is high in Magnesium, Zinc, Iron, and Potassium; it is a natural source of vitamins B1, B2, B3, B6 and amino acids (especially glutamic acid). Due to an extremely LOW GLYCEMIC INDEX of 35, it is delicious in desserts, smoothies, and pastries. A small portion serves as a healthy and energizing treat. Our Coconut Sugar is a sustainable product and helps to support local communities in Thailand. Like all natural products, colors and consistency may vary slightly. Similar to honey, crystallization can occur over time. Best if stored at room temperature. Our sugar will begin to melt above 90 degrees F. Oxidation occurs on surface areas after opening. Separation can occur. Best if used within 3 months after opening. not mixed with other Palm Sugars. (for Raw Food Purists: this is not a fully raw product, but it is far less processed than ordinary crystallized coconut or palm sugars seen in the health food store). Our Coconut Blossom Nectar Coconut Blossom Nectar is a smooth, sweet and tasty alternative to other syrups and sweeteners. Coconut nectar is made from the fresh fragrant sap of coconut blossoms, which is high in minerals, enzymes and amino acids. Coconut Nectar is low glycemic, so you will not experience cravings or spikes in sugar levels. Suggested Use: Great used in hot or cold beverages, smoothies, desserts, and on pancakes; goes great in baked goods and raw pastries. In addition to the listed Nutrition Facts our sugar contains only 12% sugar, and has a higher nutritional content than other sweeteners; it is high in Magnesium, Zinc, Iron, and Potassium; it is a natural source of vitamins B1, B2, B3, B6 and amino acids (especially glutamic acid). Due to an extremely LOW GLYCEMIC INDEX of 35, it is delicious in desserts, smoothies, and pastries. A small portion serves as a healthy and energizing treat. Our Coconut Blossom Nectar is a sustainable product and helps to support local communities in Thailand. 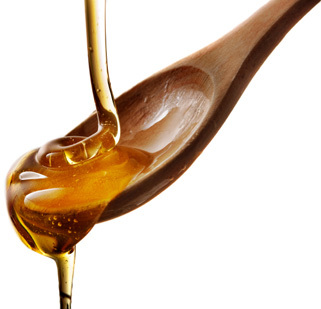 Like all natural products, colors and consistency may vary slightly, though it will be similar to liquid honey. Best if stored at room temperature. Our sugar will begin to melt above 90 degrees F. Best if used within 3 months after opening. 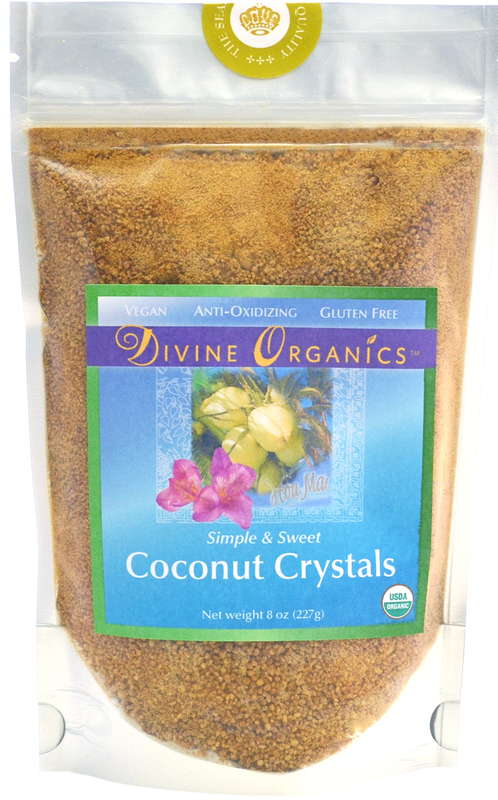 Our Coconut Crystals are derived from the sweet flower blossom nectar of the green coconut tree, Coco Nucifera, which is collected, boiled at controlled temperature and granulated. We never mix with Palm Sugar or use unsustainable sources! Certified Organic Extra virgin Coconut Oil, extracted according to local tradition from fresh coconut milk. No heating, no copra drying, no chemicals, no hydrogenation, 100% raw and pure. High oxidative stability and long shelf life with abundance of therapeutic properties (=find in our blog). 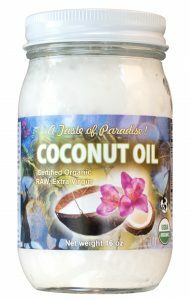 From Dr. Oz’s show: … quote “Studies have show that intake of coconut oil can help our bodies mount resistance to both viruses and bacteria that can cause illness. Even more, it also can help to fight off yeast, fungus and candida.Coconut oil can also positively affect our hormones for thyroid and blood-sugar control. People who take coconut oil also tend to have improvements in how they handle blood sugar since coconut can help improve insulin use within the body. Coconut oil can boost thyroid function helping to increase metabolism, energy and endurance. It increases digestion and helps to absorb fat-soluble vitamins.” end quote. Our coconut oil is a preferred brand of therapists and doctors. (Packaging: Glass jar for 16oz and 24 oz, food grade bucket for 1 gallon raw Coconut Oil).